The Services Marketing Triangle (or Services Triangle) shows the key actors involved in marketing a service business. It also shows the key marketing activities that occur between those actors. Intangible: you cannot see, taste, or touch them. Inseparable: you cannot separate production from consumption. Perishable: you cannot store them, save them, or return them. Heterogeneous: you cannot mass produce them as they are unique. Examples of services include hotel rooms, flights, and health club membership. Services businesses are marketed on promises. These are the promises we make to customers and whether we keep or fail to keep those promises. The Services Marketing Triangle is a visual strategic model. It reinforces the importance of people in a company’s ability to keep its promises. 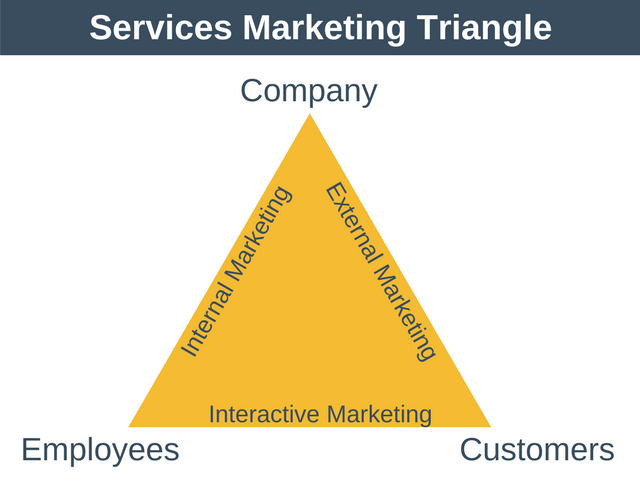 The Services Marketing Triangle is shown in the following diagram. It shows the key marketing activities that happen between the key actors within services businesses. Company: refers to the leadership team of the company in question. Employees: refers to all employees, including subcontractors who deliver the company’s service. Customers: refers to all customers and potential customers of the company. External Marketing: occurs between the company and its customers. Internal Marketing: occurs between the company and its employees. Interactive Marketing: occurs between the employees and the customers. Companies use external marketing to make promises to customers. External marketing is any communication to customers (or potential customers) that happens before service delivery starts. Informing customers if any prerequisites that must be in place before they can use the service. Within a services business, we view employees as internal customers. They are a market which we must please first as a company. 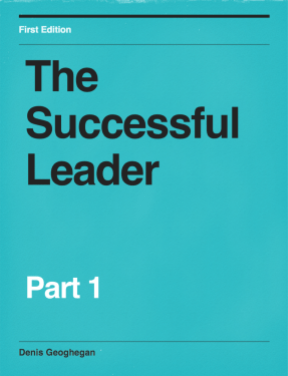 The leadership team should be focused on satisfying its employees so that they want to better serve customers. Internal marketing involves motivating employees to work as a team to make customers satisfied. This is obviously true for customer service representatives. It can equally be applied to all employees. This results in everyone, at all levels of the organization, being empowered to deliver great customer service. Interactive marketing occurs when employees and customers interact. It is here where the promises made during external marketing are either kept or broken by employees or sub-contractors. Each significant interaction between an employee and a customer is known as a service encounter. Interactive marketing is important because it establishes both short-term and long-term satisfaction. That is, if the customer is satisfied with the service they received in the short-term, they are more likely to be satisfied over the longer term. To wrap things up let’s consider a simple example, that of a luxury hotel. First, let’s consider external marketing. A luxury hotel may want to educate customers through advertising and public relations. Here, they will want to inform customers that their rooms have the finest quality fixtures, fittings, and toiletries. They are likely to also want to convey that their staff are knowledgeable and very willing to help with whatever request a customer may have. To deliver these promises the company focuses on internal marketing. It establishes more concierge roles within the hotel than the industry average. This helps ensure that staff feel they have the time they need to help each customer to the best of their ability. Employees are also trained on the local area, local activities, and excursions. The company also teaches every employee how to handle and diffuse difficult guests and situations. One of the ways that the hotel handles interactive marketing is as follows. They employ someone to manage their social media presence and reputation. Now suppose a guest tweeted that they are in their room preparing for an important meeting the next day. This would be noticed by the member of staff managing the hotel’s social media presence. Then, whilst the guest is at their meeting the hotel might leave a handwritten note and some chocolates in their room. The note will wish that their meeting went well. The chocolates will make them feel cared about and listened to. This makes the customer feel valued in the short term. It also makes them more likely to remain a customer over the long-term. The Services Marketing Triangle is a strategic marketing model. It provides a visual way of understanding the importance of people in a services business. The model is based on the fact that all services businesses are about promises. The business makes promises to its customers through external marketing. The business facilitates its employees to keep those promises through internal marketing. Finally, the business delivers its promises with interactive marketing.